Uranium (U) pollution of the surface water and groundwater of the Wonderfonteinspruit (WFS) catchment caused by gold mining over more than a century has been an ongoing concern for several decades. Triggered by a recent increase in media attention, political pressure on governmental authorities has mounted to assess the associated health risks and implement appropriate mitigation measures. However, owing to the complexity of the catchment arising from the presence of a multitude of dischargers, a complex karst hydrology and large-scale modifications thereof by deep-level gold mining, most attempts to address the issue to date have been limited to uncoordinated ad hoc studies generally suffering from a lack of temporal and spatial representivity of the underlying data. Part 2 of a series of 2 papers aimed at quantifying the extent of mining-related U pollution in the WFS catchment, this paper addresses the pollution of surface water, groundwater, as well as mine effluent. 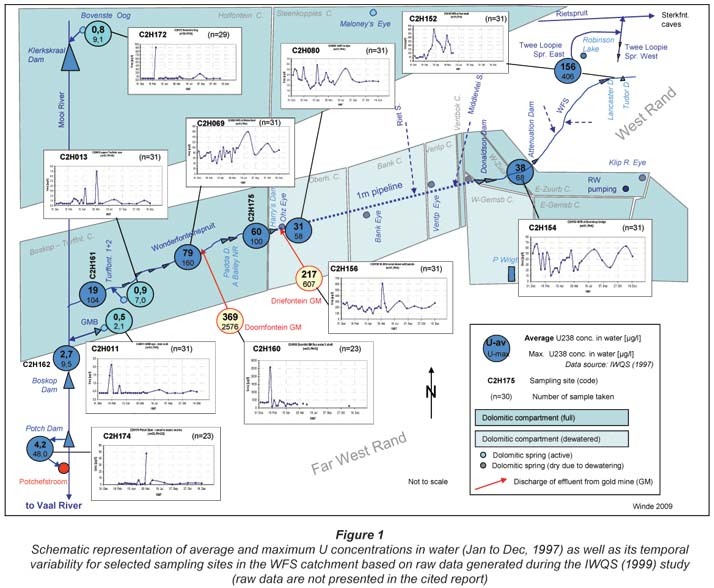 Based on close to 3 400 measured U concentrations (mostly unpublished) of water samples gathered between 1997 and 2008, an overview of U levels and associated loads in the WFS catchment is provided. Results indicate that U levels in water resources of the whole catchment have increased markedly, even though U loads emitted by some large gold mines in the Far West Rand have been significantly reduced. A major contributing factor is highly polluted water decanting from the flooded mine void in the West Rand, which was diverted to the WFS. Over the reference period, an average of some 3.5 t of dissolved U has been released into the fluvial system from monitored discharge points alone. However, since the WFS dries up well before it joins the Mooi River this U load does not usually impact on the water supply system of downstream Potchefstroom directly. It may, however, indirectly reach Potchefstroom since much of the water from the WFS recharges the underlying karst aquifer of the Boskop Turffontein Compartment (BTC), the single most important water resource for Potchefstroom. Compared to 1997, groundwater in the BTC showed the highest relative increase in U levels of the whole WFS catchment, resulting in some 800 kg/a of U flowing into Boskop Dam, Potchefstroom's main water reservoir. Of particular concern is the fact that U levels in the WFS are comparable to those detected in the Northern Cape (South Africa), which have been linked geostatistically to abnormal haematological values related to increased incidences of leukaemia observed in residents of the area. During more than a century of gold mining in the catchment of the Wonderfonteinspruit (WFS) deep-level gold mining brought more than 100 000 t of U3O8, from depths of up to 3 000 m, to the densely-populated surface areas of the West Rand (WR) and Far West Rand (FWR) (Winde, 2010). While, since 1952, U-producing gold mines in South Africa exported a total of some 240 000 t of U, more than double that amount (approx. 600 000 t) is estimated to still be contained in gold mining tailings covering some 400 km² in the Witwatersrand basin (Creamer, 2007; Robb and Robb, 1998, Winde, 2006c). These slimes dams and associated infrastructure such as return water dams, pipelines, metallurgical plants, etc., together with un-mined uraniferous ore in the mine void constitute a multitude of sources from which U migrates, mostly uncontrolled, into the environment. In addition to wind and water erosion of slimes dams transporting uraniferous tailings particles into adjacent areas, the chemical leaching of U from tailings particles and subsequent waterborne transport as a dissolved phase into subjacent aquifers and nearby streams (termed 'aqueous pathways') often constitutes the single largest source of mining-related water pollution. In mined-out areas such as the West Rand and Central Rand of the Witwatersrand basin, water flowing out of flooded mine voids may act as another major source of U pollution affecting surface water and groundwater. U pollution in the WFS catchment has recently received increased media attention, frequently unsettling members of the general public with sometimes sensationalised reports on adverse health effects on people and animals living in the area (Winde, 2010). Since recent findings on U toxicity suggest that, apart from long-known impacts on kidneys, U may also damage the brain, impact on genetic information (DNA) and act as an endocrine-disrupting compound. Therefore, voiced concerns on possible health implications and risks, despite possible sensationalism, need to be taken seriously. While many of the new findings on U toxicity are based on animal experiments, this is not true for a South African study which linked elevated U levels in groundwater to higher incidences of atypical lymphocytes related to leukaemia in the community involved, providing some direct epidemiological evidence for adverse health effects on humans under specific South African conditions (Toens et al., 1998). In view of this, a comprehensive overview of the extent of water pollution, specifically by U, in the catchment is needed as a first step to assess health risks possibly associated with U pollution. Using mostly unpublished data from a variety of sources, this paper attempts to provide such overview. Distinguishing between U concentrations and U loads, the extent of mining-related U pollution in West Rand and the Far West Rand is characterised. Owing to the presence of well-developed karst aquifers in the FWR area and the associated close hydraulic interactions between surface water and groundwater, not only the pollution of streams but also of aquifers is analysed. Fluvial U loads in different reaches of the WFS are determined, based on secondary data on U concentrations from different sources. This includes the most extensive study on waterborne U pollution in the WFS catchment conducted to date (IWQS, 1999) which is based on samples taken from January to December of 1997. A 2nd set of sources was used to characterise the subsequent developments; this consisted of data from monitoring programmes of different gold mines (Dorling, 2008; Blyvooruitzicht GM, 2008) as well the DWAF (DWAF, 2004). Where available, the flow data for the different sampling points required to calculate U loads were taken from long- and medium-term gauging records of the DWAF. For other sites alternatives sources and methods to determine flow rates had to be used. U concentration: Sampling of water from the stream as well as selected boreholes in the dolomitic compartments commenced in January 1997 and was initially done at weekly intervals. During the 2nd half of the year sampling intervals were reduced to 1 sample per month. Of the 28 sites sampled in the WFS catchment 9 pertain to stream-water in the WFS, 5 to groundwater at different boreholes and 6 to discharge points of mine effluents affecting the WFS. The remainder cover other water bodies in the catchment such as tributaries, mine dams, etc. U concentration was determined as dissolved 238U in filtered water samples (0.4 µm). 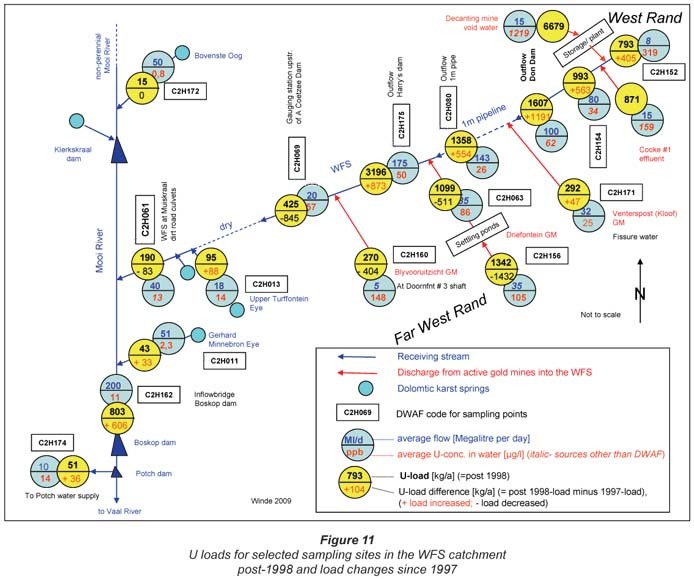 Figure 1 displays average and maximum U concentrations for selected sampling sites along the WFS as well as for 2 mine effluent discharge points calculated from raw data generated in the IWQS (1999) study. In addition the temporal variation of U levels in stream and effluent water is displayed. Analysing the spatial distribution of reported U levels, distinct differences along the course of the WFS are noticeable. By far the highest in-stream U concentrations occur at Site C2H152, right in the headwaters of the WFS illustrating the higher potential of the WR for direct stream pollution, as discussed in Winde (2010) (Fig. 1). This applies to the average concentration measured over the whole year (1997) (which exceeds the South African drinking water limit by more than 100%), as well as the maximum U level found (close to 6 times this limit). This peak is followed by a significant drop to about a quarter of the concentration, most likely owing to dilution by non-U-polluted urban runoff and large volumes of sewage effluents (the Flip Human sewage works of Krugersdorp discharged approximately 20 Mℓ/d at the time). To what extent chemical immobilisation of U in sediments, as proposed by IWQS (1999), indeed significantly reduces U levels in stream-water is still to be investigated. At this, more or less constant, U level, the WFS enters the 1 m pipeline which conveys the stream across the de-watered compartments directly onto the Boskop Turffontein Compartment (BTC). After entering the pipeline only groundwater pumped from the Venterspost Gold Mine (GM) (now part of Kloof Division, discharging some 32 Mℓ/d) and urban sewage effluent (Westonaria sewage works discharging some 11 Mℓ/d) is added to the WFS. With dilution by the presumably U free sewage effluent and slight addition of U through U-containing mine effluent from Kloof more or less counterbalancing each other, the resulting net change of U levels in the stream-water is comparably small (Fig. 1). However, after receiving discharge from Driefontein GM, the U level in the WFS downstream of the 1 m pipeline doubles. It further increases after effluents from 2 more gold mines (Blyvooruitzicht and Doornfontein) enter the WFS via 2 canals. With an average of 79 µg/ℓ, the U level downstream of the 2 goldfields exceeds the South African U limit for drinking water most of the time (time series of Station C2H069 is given in Fig. 1). It should be noted that this water, the U content of which exceeds the irrigation guideline by almost 8 times, was abstracted from downstream farm dams (AC Dam and Visser Dam 1 and 2) and used for irrigating well over 100 ha of mainly fodder maize as well as being used for livestock watering (IWQS, 1999). The maximum U concentration recorded at this site peaks at more than double the drinking water limit (Fig. 1). Compared to the regional natural background of 0.8 µg/ℓ measured at Bovenste Oog (C2H172), a dolomitic spring regarded as largely unaffected by gold mining, this indicates a mining-related increase of U levels in water by about 2 orders of magnitude. The drastic drop to about a quarter of the average U concentration just before the confluence with the Mooi River (at Muiskraal Bridge, Station C2H161; Fig. 1) again was attributed to natural U attenuation in fluvial sediments and dilution by relatively clean groundwater issuing from the Turffontein springs (IWQS, 1999). It was only recently established, however, that the WFS rarely flows beyond 2 or 3 farm dams downstream of Welverdiend and commonly does not reach the confluence with the Mooi River (Winde, 2008). The water sampled at Muiskraal Bridge (C2H161), therefore, does not represent the WFS as it flows through the 2 goldfields but consists, entirely, of spring water discharged from the 2 Turffontein springs and exfiltrating groundwater (baseflow) from the BTC. This finding raises the question to what extent the upstream-located A Coetzee's Dam could, at the time, possibly have impacted on the water quality in the Mooi River, as argued in the legal action brought against Blyvooruitzicht by the Potchefstroom municipality (Winde, 2010). Comparing time series data for all stations, a generally high variability of U levels in stream-water is discernable, with max./min. ratios used to quantify the extent of fluctuations reaching up to 900 (C2H159). Compared to this, the U dynamic in groundwater (as represented by the 3 measured karst springs Gerhard Minnebron  C2H011; Bovenste Oog  C2H172 and the upper Turffontein Eye  C2H013) is significantly lower (Fig. 1  time series of stations C2H011, -172 and -013). Possible causes for U fluctuations in fluvial systems, especially in mining areas, are discussed in detail by Winde (2006b). These causes include natural oscillations of the stream chemistry triggered by the solar cycle and photosynthesis, as well as impacts of rain storms, spillages and day-night pumping regimes of discharging gold mines. Winde et al. (2004) suggest that these factors result in peak U concentrations often occurring at night time and during or shortly after rain events. Since sampling is usually suspended at such times, associated U peaks are commonly missed by standard monitoring protocols. Given the highly dynamic nature of U levels this, in turn, is likely to result in a general underestimation of the true extent of fluvial U pollution. This even more so as the weekly samples were generally taken on a fixed day of the week at more or less the same time, missing specific processes and practices within production- and cost-driven discharge cycles. In some instances knowledge of sampling times was reportedly also used by some dischargers to manipulate quality and flow of released effluents (Stoch, 2008). In view of this, the extension from weekly to monthly sampling intervals further reduced the temporal representivity of the results. (The change of sampling intervals was allegedly due to observed auto-correlation of weekly sampling data. However, efforts to reduce costs reportedly also played a role (Stoch, 2008)). Apart from the stream, U levels in mine effluents were also found to fluctuate considerably (Doornfontein GM  C2H160 and Driefontein GM  C2H156). Assuming that the majority of the discharged water originally stems from the dolomitic karst aquifers, a less dynamic U behaviour reflecting the typical inertia of a large water volume was to be expected. While the quality of dolomitic ingress water is indeed rather constant, the highly fluctuating U levels are mainly caused by irregular patterns of process water discharges (Erasmus, 2009). The comparably high inertia of dolomitic groundwater to pollution events is illustrated by U levels found in water issuing from karst springs. Elevated U levels in spring water are commonly confined to isolated U peaks while for most of the time low U concentrations at or around natural background levels prevail. The spikes and re-occurring nature of the U pollution in groundwater may point to short-term influxes of U possibly associated with rain, flood or discharge events somehow injecting U into the aquifer. However, a similar pattern occurs at the Bovenste Oog where no such anthropogenic U influx can be assumed (Fig. 1). At Bovenste Oog, U from a natural source (e.g. geological strata) may somehow be mobilised. This (hypothetical) natural source appears to have a higher impact on the U level than the multitude of mining-related U sources upstream of the Gerhard Minnebron (GMB) and Turffontein springs. (The possibility that the discharge of large volumes of highly U-polluted mine-water from the West Rand onto the Steenkoppies Compartment during the 1980's could have caused long-term U pollution of the Bovenste Oog is discussed in Winde (2010)). Displaying a lower average (0.8 µg/ℓ vs. 0.5 µg/ℓ) and a lower maximum U concentration (9.1 µg/ℓ vs. 2.1 µg/ℓ) the GMB spring, in 1997, was 'more pristine' than the Bovenste Oog, despite significant U pollution affecting surface and groundwater in upstream areas. A similar pattern of U dynamics as observed for the karst springs occurs in the Potchefstroom Dam (C2H174), pointing to some inertia of large water bodies, which are able to buffer effects of short-term U inputs through dilution. It is of note, however, that the maximum U concentration measured directly at the inlet to the Potchefstroom water works (48 µg/ℓ) is as high as in the WFS downstream of some of the mining discharges (e.g. 58 µg/ℓ at C2H080, Fig. 1). Assuming that this value is not an error it may point to pulses of polluted water moving from the mining area through the karst system, creating short-term peaks of U in downstream water bodies. U loads: While concentration values are commonly used to assess, for example, potential health effects, they are not sufficient to quantify (long-term) impacts on the receiving environment. This is particular true for discharges containing non-biodegradable contaminants such as U and other heavy metals, which tend to accumulate in sediments, soil, etc. through secondary enrichment. In order to quantify the potential of U for such off-site enrichment, the total mass of discharged U ('U load') needs to be determined. Based on IWQS U concentration data for 1997 and flow estimates derived from DWAF gauging records or other sources, Fig. 2 displays first-order estimates for loads of dissolved Unat (i.e. not including U bound to particulate matter such as suspended sediment, spilled and eroded tailings or windblown tailings dust). Owing to error margins associated with flow rate calculations, as well as the use of average U concentration values, loads calculated for different sites do not always match. For example, the U load from Driefontein GM entering the WFS near its outflow of the so-called '1 m pipeline' (an approximately 30 km-long pipeline of 1 m diameter), together with the load leaving the pipeline, results in a total of 2 415 kg U/a while only 2 323 kg/a were found at Harry's Dam (C2H175) where both waters have mixed (Fig. 2). In some instances, however, mixing may occur only downstream of Harry's Dam since effluent from Driefontein can be routed around Harry's Dam. However, in view of the uncertainties associated with the sampling, analytical techniques and flow estimates, a misfit of less than 4% is significantly smaller than expected. This even more so, as natural processes such as geochemical immobilisation partly remove U from the water column and thus reduce total loads. Along the course of the WFS, U is mainly attenuated in sediments of shallow farm dams where specific conditions cause above-average rates of U precipitation, as explained in detail in Winde (2006b). However, such quasi-natural U removal is not the only cause of the generally decreasing U load observed in the WFS, which along the approximately 8 km-long stretch between Harry's Dam (C2H75) and Gauging Station C2H069 effectively 'loses' close to 1 800 kg/a U (2 323 kg/a leaving Harry's Dam plus the 674 kg/a that the stream receives from Blyvooruitzicht GM) (Fig. 2). Most of this 'loss' is due to a significant reduction in flow (from some 106 Mℓ/d at Harry's Dam to an average of 44 Mℓ/d at C2H069) rather than a decreasing U concentration. In the absence of large-scale water abstraction for irrigation or any other purpose and only limited livestock watering the cause of this drastic flow reduction still needs to be researched, especially since the extent of stream loss seems to have increased in recent times. In 2005, close to 90% of the water (89 Mℓ/d) has been 'lost' between Harries Dam and C2H069 (average flow in 2005: 11 Mℓ/d; DWAF, 2008), compared to 60 Mℓ/d in 1997. Considering that sewage works at Carletonville and Khutsong add additional volumes of sewage effluent of some 10 Mℓ/d to the WFS between Harry's Dam and C2H069 the actual loss is even higher. A possibly contributing factor may be the silting up of the WFS stream channel, which in the late 1960s was artificially widened by the gold mines to what became known as 'mid-stream canal', in order to accommodate the large pumping volumes during the drawdown phase of de-watering, thus preventing flooding of adjacent farmland. Since regularly cleaning out of sediment from the canal was abandoned in the late 1990s the mid-stream canal has gradually filled up with sediments forcing the water onto adjacent land. This, in turn, led to an enlarged area of open water where increased evaporation may account for some of the water lost. The largest part of the water is, however, likely to recharge the underlying dolomitic aquifer of the BTC via caves and sinkholes located in the flooded area (Erasmus, 2009). The exceptionally low flow in 2005 may have additionally been caused by a lack of fissure water normally discharged from Kloof GM. Owing to the relocation of pumping infrastructure from the old Venterspost Shaft (which threatened to partially collapse) to No. 10 Shaft, a section of the mine void between the 2 shafts had to be flooded (Laas, 2008). The flooding was possibly facilitated with pumped water that would normally be discharged into the '1-m pipeline', temporarily reducing the inflow into Harry's Dam by some 30 to 35 Mℓ/d. Compared to the Turffontein Eye, which feeds into the WFS after it has dried up several kilometres upstream, U loads downstream of the springs (measured at C2H061) significantly increase even though no visible inflow enters the stream at this reach. The load increase is, therefore, most likely attributable to polluted groundwater diffusely exfiltrating from the BTC. This may also account for the large wetland accompanying the streambed in this stretch. Why such exfiltrating groundwater would show elevated U levels while groundwater from the same compartment flowing out at Turffontein Eye does not remains unclear. The baseflow from the BTC appears to be the single largest U source impacting directly on the water quality of the upper Mooi River, resulting in close to 200 kg/a of dissolved U flowing into Boskop Dam, the main water reservoir of the Potchefstroom municipality. It is of concern that, based on the 1997 data, some 15 kg of dissolved U per year enters the drinking water system from the Potchefstroom Dam. Since the latter is fed by water from the Boskop Dam, from which the majority of water (approx. 30 Mℓ/d) is abstracted for Potchefstroom, raw water entering the municipal water works, in total, carries more than 60 kg/a of U. How much of this U is removed through the water purification process at the Potchefstroom water works is unknown. In this regard it is of importance to note that the removal efficiency for U of standard potabilisation processes such as coagulation, flocculation, settling, filtration and chlorination significantly decreases with increasing levels of hydrogencarbonate (HCO3-), calcium (Ca2+), and magnesium (Mg 2+) ions in the water (Baeza et al., 2008). Since all 3 ions are naturally elevated in dolomitic water, of which nearly all the raw water for Potchefstroom consists, the removal efficiency for dissolved U at the Potchefstroom water purification plants is most probably low compared to non-dolomitic water. That at least part of the U ultimately finds its way into the tap water is indicated by elevated U levels in calcite scales of water kettles sampled from various households in Potchefstroom. Preliminary scans of scales from water kettles sampled at 10 different locations indicated an average of 20 mg/kg U, compared to an average of around 1 mg/kg in 10 samples from Ventersdorp households where the dolomitic water source is not impacted on by gold mining (Winde, 2003). This enrichment of U in precipitated calcite scales also suggest that the temperature-induced co-precipitation of U along with calcium carbonate constitutes another mechanism that may reduce U levels in tap water prior to human consumption thus lowering the overall U intake. Soon after completion of the IWQS study the DWAF started monitoring U levels at sites identified by IWQS (1999) at monthly intervals (DWAF, 2004). For the upper part of the WFS these data are complemented by a more recent water monitoring programme of Harmony Gold Mine, implemented in 2002, which also analyses the WFS for U (Dorling, 2008). In the lower part of the WFS, the earlier-mentioned programme of the Blyvooruitzicht GM complements U data from DWAF with weekly U analyses. For the Turffontein Eye, which is located in this reach, weekly data on U levels in spring water are available for 6 months of 1997 (Anonymous, 1997). A 3rd monitoring programme is conducted by the Potchefstroom municipality focusing on the lower WFS and the Mooi River in the vicinity of the municipal water works (Nel, 2007). For some of the monitored sites U data gathered by various ad hoc investigations are also available (Barthel, 2007; Coetzee et al., 2002; Coetzee et al., 2006; Winde, 2000; 2008). An overview of the range of U concentrations and associated U loads found in the WFS is provided in Table 1a and 1b. The U data displayed in Table 1a and 1b are based on a total of 3 375 water samples collected between 1997 and 2008 at 44 different sites in the WFS catchment. Since some of the sites that have been sampled by IWQS (1999) are not included this data set it is not exhaustive. Just under half of all samples (1 497 samples) were taken at 18 sites in the upper WFS catchment while the other half originates from the lower WFS and the upper Mooi River (1 878 samples from 26 sites). The overwhelming majority of data were generated by 5 different monitoring programmes complemented by 5 different grab sample-based studies. In total U has been analysed by 7 different laboratories using 4 fundamentally different, analytical techniques − this reduces the risk of a systematic error affecting all U analyses in one specific way (Table 2). Comparing U levels found by different studies at identical or at least comparable sampling sites generally indicates an overall good degree of consistency between the data. This includes average as well as maximum U concentrations (Table 1a and 1b). An exception are some data generated by the Council for Geoscience (CGS), which appear to be either too low or too high compared to other sources for identical sites. This might be explained by the fact that the CGS frequently used semi-quantitative scans of lower accuracy to determine U concentrations. It appears that U concentrations were under-determined in water which contains little U such as the upper Mooi River at Site No. 34, where the determined average of 1.8 µg/ℓ is an order of magnitude below the one found by DWAF (2004) (11 µg/ℓ). The difference is even higher for the maximum U values (CGS: 8 µg/ℓ vs. DWAF: 142 µg/ℓ) (Table 1b). Given that the probability of hitting high U values in fluctuating systems increases with the number of samples taken, one would expect to find higher U maxima in Potchefstroom's sampling programme (which uses CGS analytical facilities), which is based on nearly double the number of samples than the DWAF programme (Table 1b). A recent comparison of quantitative ICP-MS split samples results between the CGS and a Swedish lab indicated an overall good agreement (Tarras-Wahlberg, 2008). This too may point to the employment of semi-quantitative scans rather than quantitative analyses as cause of the observed misfits. Since the DWAF data at other sampling sites compare favourably with data from alternative sources the fault, if any, appears to lie with the CGS analyses. While underestimating at low levels, semi-quantitative scans often overestimate at higher U levels. This is indicated at Site No. 27 (Table 1b, WRC 1214 column) where an average of 192 µg/ℓ in only 4 samples compares to 65 µg/ℓ and 71 µg/ℓ based on a much larger number of samples (total n = 309). While it cannot be excluded that these exceptionally high concentrations were indeed present at the sampling date, the rare occurrence of such peaks found in other monitoring programs suggests that the probability of hitting such levels in just 4 grab samples is rather low. Since similarly high values were also found at other sampling sites where other monitoring programs indicate lower levels it is assumed that semi-quantitative analyses tend to overestimate U concentration once a certain threshold U concentration is exceeded. For this reason U values generated by the CGS, as used in Nel (2007); Coetzee et al. (2006) and Coetzee et al. (2002), are not included in this interpretation. This is particularly unfortunate as it excludes the large data set from the long-term monitoring programme of the Potchefstroom municipality (Nel, 2007) from the analysis. Although the DWAF programme is still ongoing only data for the period 1998 to 2003 were available. This is unfortunate as data relating to possible impacts associated with the diversion of decanting mine-water from the WB which has taken place post-2003 are not available. Furthermore, sampling at sites in the upper WFS (C2H152 and C2H154), which is likely to be particularly affected by decant-related water quality changes, was suspended in 2000 (Table 1a). Owing to this the DWAF U data in the upper WFS mostly reflect U levels between August 1998 and May 2000 (Table 1a). Fortunately, the resulting gap for the period 2000 to 2008 is mostly filled by data from the monitoring programme of Harmony Gold Mine, which includes monthly samples for the entire headwater region for the period January 2002 to April 2007 (Dorling, 2008). The Harmony data set displays the highest spatial and temporal representivity and is the most comprehensive one for assessing U levels in the headwater region of the WFS. Both monitoring programmes in the upper WFS area are complemented by grab samples from 4 different studies. While limited in number of samples and sampling sites, such point data often provide useful benchmarks to check to what extent the order of magnitude of U levels found by monitoring programmes is confirmed. Owing to a relatively small catchment surface area of some 133 km² (at outflow of Donaldson Dam; AED, 2006), representing less than 10% of the total catchment area of the WFS, and to the fact that half of all samples are taken there, the upper WFS area displays a higher sampling density that the lower catchment. However, when related to stream length the sampling density between the 2 catchments is comparable. Regarding the number of samples taken per site, the headwater region displays a somewhat higher average than the lower catchment (83 vs. 72 samples per site). The highest number of samples in the upper catchment was taken at Site No. 6 (C2H153: 115 samples) and Site No. 11 (C2H154: 120 samples,) both reflecting in-stream U levels of the WFS (Table 1a). The highest number of samples (317) in the whole catchment relates to the first shallow farm dam downstream of all mining effluents in the lower catchment, known as Andries Coetzee's Dam (AC Dam, Site No. 32 in Table 1b). In a study following that of IWQS (1999) this dam was found to contain significantly elevated U levels in its sediments (Wade et al., 2002). The dam has remained a focus of attention ever since (Coetzee et al., 2002; Coetzee et al., 2006; Barthel, 2007; WAG, 2007; Clay Disposal CC, 2007). Sampling Site No. 35 (WFS at Muiskraal bridge) and 31 (WFS at C2H069) also enjoyed an above-average sampling frequency with 195 and 89 samples, respectively (Table 1b). Although covered by a comparably high number of samples, Sites 40 (Mooi River at Muiskraal) and 43 (Potch dam) are less well represented since a large part of the data had to be omitted due to the analytical problems pointed out earlier (Table 1b). As was the case in the upper region, DWAF monitoring data for the lower WFS are complemented by the monitoring programme of a gold mine (Blyvooruitzicht GM, 2008). In contrast to other gold mines which also measure U levels in their effluents (which were unfortunately not available), the Blyvooruitzicht programme includes sampling of receiving water courses as agreed in the out-of-court settlement with Potchefstroom municipality in 2003. With weekly sampling intervals covering several years (February 2003 to January 2008) this data set is one of the most recent and displays the highest temporal representivity of all data in the lower WFS catchment (Table 1b). For the Turffontein Eye, data from a short-term, high frequency (weekly) sampling programme covering the 1st half of 1997 fill the gap between the 1997-data from IWQS and the DWAF monitoring which started in May 1998 (Table 1b). U concentrations: Owing to the fact that the data cover different periods of time care must be taken in comparing them with each other in order to identify possible trends. Figure 3 provides a spatial reference for instream U levels at selected sites in the WFS gathered between 1997 and 2008. Upper WFS: Comparing the DWAF (2004) data, which cover a 21-month period between August 1998 and May 2000, with those from 1997 indicates that for the outflow point of the WR (Site No. 17: start of 1 m pipeline) little has changed with regard to the average U level in stream-water (38 µg/l vs. 44 µg/ℓ). The same is true for the detected maximum concentration (71 µg/ℓ vs. 76 µg/ℓ) (Fig. 3). However, given the comparatively high number of samples underlying both studies, the increases of 16% of the average value and 7% of the maximum U concentration might be indicative of an overall trend of rising U levels. Such a trend is also confirmed by more recent data from Dorling (2008) indicating an average U level at the outflow of the Donaldson Dam (Site No. 16, Fig. 3) of 62 µg/ℓ, representing an increase in average U concentration by over 60% since 1997 and by close to 41% since 2003. (Since water from Donaldson Dam is directly transferred to the 1 m pipeline (via a 750 mm diameter pipeline) and constitutes the majority of water fed into the '1 m pipeline', its U concentration can be compared to that of the 1 m pipeline inflow point.) Of particular concern is the drastic increase of the U maximum exceeding 1997 levels by an order of magnitude (759 µg/ℓ compared to 71 µg/ℓ and 76 µg/ℓ; Fig. 3). In view of the rather large dilution capacity of the dam (maximum storage capacity of 1 000 Mℓ, AED, 2006), such U peaks at the outflow point are indicative of large pulses of polluted water moving through the dam and subsequently into the 1 m pipeline. Furthermore, Fig. 4 illustrates that U levels are permanently above the South African target water quality range (TWQR) for irrigation water (10 µg/ℓ), resulting in a potential risk for the adjacent 20 ha irrigation farm, which uses approximately 0.6 Mℓ of stream-water per day for irrigation (AED, 2006). A significant increase in U levels of stream-water is also found in the near-source area of the WFS (Site No. 4 in Fig. 3), where the average instream concentration more than doubled between 1997 and 2000 (from 156 µg/ℓ to 319 µg/ℓ). A similar trend is noticeable for the U maximum which increased from 406 µg/ℓ to 705 µg/ℓ, exceeding the TWQR for irrigation water by a factor of over 70 and for drinking water by a factor of 10. Figure 5 indicates, furthermore, that this maximum value is only one of many other U peaks reaching several hundreds of µg per litre. In view of such drastic increases in U levels it is most unfortunate that the DWAF discontinued sampling at the site in 2000. One possible cause for this drastically increased U influx is the discharge of large volumes of semi-treated water decanting from the flooded mine void. Following a DWAF Directive this water was diverted from the point of decant, located outside the WFS catchment (at an abandoned shaft known as Black Reef Incline Shaft  BRI), via a former mine-water reservoir known as Robinson Lake, into the WFS (AED, 2006). Between January 2004 and May 2005 the average U concentration in Robinson Lake was 1 219 µg/ℓ, with a detected maximum of 3 100 µg/ℓ. Almost 2 years after the decant started, U levels in the lake displayed no discernable consistent decrease. In a dam of the Twee Loopie Spruit, a small stream north of the continental divide into which the decant initially runs, an even higher U peak of 3 600 µg/ℓ was found (Dorling, 2008). In accordance with the mentioned DWAF Directive, a maximum of 15 Mℓ/d of semi-treated mine-water was subsequently discharged into the Attenuation Dam of Harmony GM situated some 10 km upstream of Donaldson Dam. Since the Donaldson Dam is located on top of dolomite, seepage is likely to pollute groundwater in the Zuurbekom Compartment as indicated in an earlier study. Conelly and Rosewarne (1984) found a plume moving from Donaldson Dam preferentially along 2 dykes (Panvlakte and Magazine dyke) towards the Zuurbekom pumping station, from which Rand Water, for more than 100 years, pumps groundwater for the greater Johannesburg area. With increased volumes and higher U levels in the dam water, associated threats to the quality of groundwater abstracted at Zuurbekom should be re-investigated. Another possible cause for this increase may be related to the re-mining of eroded tailings deposited in Lancaster Dam (located directly in the streambed of the WFS) by Mogale Gold during this period. The use of high-pressure water cannons to hydraulically mine the compacted slimes material is likely to not only have mobilised polluted tailings pore-water and seepage but also to have increased the particulate transport of U through flushing down re-mined tailings material. Observed breaches in the dam wall of Lancaster Dam are likely to have resulted in polluted water may escaping downstream and contributing to the the observed U increase. Since a large area of tailings remains exposed to the elements storm events with typical high rainfall intensity may continue to cause elevated loads of U leaving the site. In both data sets (IWQS, 1999 and DWAF, 2004) this early peak of pollution close to the source area of the WFS is followed by a significant drop further downstream in the headwater region. Occurring well upstream of the point where large volumes of treated sewage effluents (of presumably low U concentration) from the Flip Human Sewage Works (Krugersdorp Municipality, now known as Mogale City, Site No. 6 in Fig. 3) are discharged into the WFS the cause of this drop is not quite clear. Its existence is also confirmed by the more recent Harmony Mine data (2002-2007). Dilution through runoff from adjacent informal settlements can hardly explain the drop since this would require volumes of an order of magnitude higher than the stream flow at this point (totalling a flow rate of over 100 Mℓ/d as opposed to an estimated 8 Mℓ/d observed for this reach). It is therefore suspected that either water sampled at Site 4 is not representative of stream-water but actually consists of (almost undiluted) tailings seepage or other polluted water, or that U is removed very rapidly by a wetland through which the stream runs between the 2 sites. Although high U levels in sediments of these wetlands (Barthel, 2007) would generally support a significant rate of U immobilisation, such a degree of U removal is not found for other, similar wetlands along the WFS. However, should chemical differences between non-dolomitic and dolomitic water allow for a vastly accelerated U removal in this wetland, then the currently proposed excavation of U-polluted sediments (Iliso Consulting Ltd., 2008), which would destroy the wetland in the process, would cause a significant increase of U levels downstream. While no clear trend is discernable for U levels in the headwater region it is safe to say that U reservoirs in the WR by no means appear to be exhausted but continue to pollute the WFS to a significant extent. Lower WFS: The significant increase of U levels in water at the inflow of the 1m pipeline is, for some reason, not accompanied by an associated rise of U concentration at the outflow of the pipe as one would expect. In fact, the average U concentration decreases by almost 20% while the maximum value remained nearly constant (Fig. 3, Site No. 18). Again it must be noted that DWAF data end in January 2004, before the decant water was diverted into the WFS. However, similar low levels have also been found by two independent recent grab-sample based studies (Barthel, 2007; Winde, 2008). Since the diversion of decant water into the WFS appears to have later been abandoned samples taken by the latter studies (December 2006 and early 2008) might have already missed possibly associated U peaks. For sampling sites located further downstream, the trend of slightly decreasing average U levels continues, including C2H069 (Site No. 31, Fig. 3), for which a comparably large dataset is available. DWAF data suggest that the average U level dropped by almost 40% from 79 µg/ℓ in 1997 to 57 µg/ℓ in the period June 1998 to August 2003. Comparing this with the more recent, high-frequency sampling data from Blyvooruitzicht GM for A Coetzee's Dam (Site No. 32, a few hundred meters below Site 31), which represents more or less the same water, confirms the drop of average U levels even though the reduction is significantly smaller (11% instead of 40%). However, with an average concentration of 71 µg/ℓ U, the WFS at the outflow of the FWR goldfield continues to exceed not only the stricter irrigation limit but also the limit for drinking water for most of the time (Fig. 6). Similarly to the upper WFS, pronounced U peaks also occur in the lower WFS. With 566 µg/ℓ the maximum U concentration detected through weekly sampling of the Blyvooruitzicht GM is more than 3 times higher than that found in 1997 by IWQS (1999). It also puts the significantly lower maximum found by DWAF for the period 1998 to 2004 into perspective, suggesting that there is no general trend towards reduced U peaks in the lower WFS. While U levels in the lower WFS might have been more or less constant over the past 12 years or so, this seems not to be the case with the dolomitic groundwater in the Boskop Turffontein Compartment. Issued from 2 karst springs known as the upper and lower Turffontein Eyes (see Site No. 34 in Fig. 3), this groundwater allows perennial stream flow to resume in the lowest reach after the WFS dries up some distance upstream. A 3rd karst spring is located outside the WFS catchment and is known as Gerhard Minnebron (GMB) Eye (Site No. 39 in Fig. 3). For the 2 measured karst springs, marked increases in U concentrations were found. At the upper Turffontein Eye the average U concentration increased from 0,9 µg/ℓ in 1997 to 14 µg/ℓ between May 1998 and December 2003, representing a total increase of close to 1 600 % (Fig. 3). During the same period the maximum U level measured in spring water rose 6-fold from 7 µg/ℓ to 43 µg/ℓ. Furthermore, both data sets, IWQS (1999) as well as DWAF (2008), indicate a clear increase of U levels some distance downstream of the eyes without any surface water entering the stream in between. This suggests that baseflow in the form of U-polluted groundwater from the BTC somehow enters the stream channel and increases the U concentration in the receiving stream by factors from just under 2 (DWAF 2004: 14 µg/ℓ to 22 µg/ℓ) to over 20 (IWQS 1999: 0.9 µg/ℓ to 19 µg/ℓ) (Site No. 35, Fig. 3). Given the fact that approximately half of the water at the Muiskraal Bridge consists of clean spring water with low U content, the U-concentration in the baseflow entering the stream should be approximately twice as high as the in-stream value measured after the 2 waters mixed. Thus, the average U level in the exfiltrating, lower-lying groundwater of the BTC is approximately 40 to 50 µg/ℓ, displaying peak concentrations between 100 µg/ℓ and 200 µg/ℓ. Figure 7 illustrates the temporal pattern of U levels at the Muiskraal Bridge, suggesting for the period 1998 to 2003 the existence of a more or less continuous load of U ('base load') of around 20 µg/ℓ. To date, however, it remains unclear why the exfiltrating groundwater (baseflow) at the Muiskraal Bridge is significantly more polluted than the spring-water at the Turffontein Eye, given that both originate from the same dolomitic compartment. A possible explanation may be related to the fact that the water level at the Muiskraal Bridge is significantly lower (14 m) than the water table at the upper Turffontein Eye (1 423 m a. m. s. l.). In view of the generally flat topography of the dolomitic area this is a considerable height difference and may allow for different strata of groundwater to be intercepted at the 2 sites. Differences between the 2 sites are further highlighted by the fact that, in 1997, the baseflow-impacted stream at the Muiskraal bridge was already significantly polluted with U (average concentration of 19 µg/ℓ and a measured maximum of 104 µg/ℓ), while the Turffontein Spring and the GMB Eye still had close to natural background levels of U (average U concentrations of 0.9 µg/ℓ and 0.5 µg/ℓ, respectively). This changed in the period 1998 to 2003 when, according to DWAF data, average U levels at the Muiskraal Bridge remained more or less constant (22 µg/ℓ compared to 19 µg/ℓ in 1997) while the U levels at the 2 eyes rose significantly. This suggests that the lower-lying groundwater in the BTC which exfiltrates into the WFS upstream of the Muiskraal Bridge is somehow more exposed to U pollution than groundwater feeding the higher-lying karst springs. However, since 1998, this difference in exposure seems to have changed and now also affects the higher-lying groundwater where U levels increased while the lower-lying groundwater improved over the same period. So far we have no plausible explanation as to what the cause of this changing exposure may be. As mentioned the average U level at the Muiskraal site dropped between 2003 to 2006 by some 40% to 13 µg/ℓ (again, the actual U concentration in the undiluted groundwater before it mixes with the spring water in the stream channel is approximately double this value, i.e. 26 µg/ℓ). To what extent this decrease represents a consistent trend to lower U levels is uncertain, as the measured U maximum rose to 172 µg/ℓ, well exceeding previous maxima (equalling 344 µg/ℓ in groundwater before mixing). While a higher U maximum is to be expected given the much larger number of samples taken (105 compared to 22 and 25, respectively, in previous samplings) the lower average may result from the 'spiky' nature of U pollution. High U concentrations are confined to relatively few short-term peaks while, for most of the time, U levels are 1 or 2 orders of magnitude lower. However, for this period, the existence of a (somewhat lower) base-load of U at around 10 µg/ℓ is confirmed (Fig. 8). The occurrence of intermittent U peaks in groundwater of the lower BTC suggests that U pollution there may be caused by some kind of (re-occurring) short-term event (such as rain storms, floods, discharge events, accidental spills, etc.) that somehow trigger an influx of U into the karst aquifer, as opposed to a more or less continuous influx of polluted stream-water polluting the BTC on an ongoing basis. Therefore, no direct link seems to exist between the continuous stream loss of U-polluted water in the upper BTC and the sporadic U peaks in groundwater of the same compartment further down. Similar patterns to those observed in the WFS at the Muiskraal Bridge were found at the GMB Eye and the upper Turffontein Eye (Fig. 9). Apart from the differences in general water quality between the springs at Turffontein and GMB, which has been known since the late 1890s, both also display distinctly different U levels, with those at GMB (1997) being roughly only half of the average of Turffontein (Fig. 3). Between January 1998 and June 2003 the average U level at GMB increased 4-fold to 2.3 µg/ℓ, now exceeding the maximum recorded in 1997. The peak concentration between 1998 and 2003 (21 µg/ℓ) exceeds the 1997-maximum by an order of magnitude. No such increase was observed for the control site at Bovenste Oog which is not impacted on by mining. Here U levels remained constant at 0.8 µg/ℓ (Site No. 36, Fig. 5). In comparison to the GMB eye, the Turffontein Spring appears to have been more exposed to U pollution after 1997, displaying more frequent and higher U peaks (Fig. 9). Higher U levels also occurred downstream of the 2 eyes, increasing the average U concentration in the upper Mooi River at Boskop Dam by almost 5 times (from 2.7 µg/ℓ to 11 µg/ℓ). Of particular concern is the comparably high U maximum of 142 µg/ℓ, which exceeds the one found in 1997 by almost 16 times (Fig. 5, Site No. 40). A similar trend is evident for the Potchefstroom Dam (Site No. 43, Fig. 5), where the average U level of water that feeds directly into the water works rose more than 3-fold (from 4.2 µg/ℓ to 14 µg/ℓ). However, in contrast to the karst springs, this increase in stream-water seems to be caused less by isolated peaks but rather by generally higher U levels in all 3 samples taken in 2004 (Fig. 10). U load  surface water: Based on average U concentrations and water volumes, loads of dissolved U have been calculated for selected sites in the WFS catchment (Tables 1a and 1b, far right column). For selected sites, changes in U loads between 1997 and the post-1998 period are depicted in Fig. 11. While U loads at some sampling points declined since 1997 (negative values), they increased at others (positive values) (Fig. 11). The net change for the WFS system as a whole is a cumulative increase of 3 419 kg U per year. This corresponds with a net increase of fluvially-transported U reaching the Potchefstroom area via the Mooi River of 606 kg/a (Fig. 11, C2H162). The increased U pollution of the WFS system is mainly attributable to a significant rise in U-loads emitted by the WR goldfield, which increased almost 4-fold from 430 kg to 1.6 t/a (Fig. 11). A large part of this increase is presumably caused by the discharge of considerable volumes of semi- and partly-untreated mine-water from the flooded Western Basin, which carries a U load of close to 7 t/a out of the mine void. Owing to natural removal of U through precipitation and adsorption while being transported and stored, as well as treatment, not all of the U is injected into the WFS. However, the decant volume used to calculate this load relates only to the maximum discharge which, according to the DWAF Directive, is allowed to enter the WFS. With reported decant volumes of up to 50 Ml/d in wet seasons (Hobbs et al., 2009) and higher U levels in the initial decant phase, the associated average, annual U load leaving the mine void could be well over 10 t/a. However, mine effluents from the actively mining Cooke section of Harmony GM (which geographically falls into the Central Rand goldfield and was not monitored in 1997) also contribute significantly to the increased U load in the WFS (Fig. 11). As mentioned earlier, U levels in the uppermost section of the stream (C2H152), which is unaffected by decanting mine-water or effluents from active underground mining, also rose considerably, resulting in an almost doubling of the load of U since 1997 (Fig. 11). Possible causes for this significant increase have been explored above in connection with changes in U concentrations. In contrast to the significant increase of the U load imported from the upper catchment, U loads emitted by major discharging mines in the FWR decreased considerably from approximately 3.7 t in 1997 to 1.9 t for the period 1998 to 2008, of which only some 87% (1 661 kg) actually reach the WFS. The remainder is trapped in the settling ponds of Driefontein GM (243 kg/a). Compared to the 1997 data the removal rate of the settling ponds appears to have significantly decreased, from 1 163 kg to only 243 kg removed per year. Despite this, Driefontein GM, according to DWAF (2004) data, reduced the total U load discharged into the WFS between 1998 and 2003 by approximately a third, relative to 1997. (This drop appears to be owed largely to reduced U levels in the pumped groundwater (105 µg/ℓ instead of 217 µg/ℓ in 1997). An even larger reduction is observed at Blyvooruitzicht GM where U loads decreased by 60% (from 674 kg/a to 270 kg/a) in the same period (Fig. 11, Table 3b). Whether active mitigation measures by the mine, reduced operations or an natural decrease in U levels of the pumped water or any combination of the above factors is responsible for the drop is unclear. For the reach of the WFS that runs on the non-dewatered BTC from Harry's Dam (near the outflow of the 1 m pipeline) to below Welverdiend, a similar situation as in 1997 prevails. Again large amounts of U are lost from the stream over the approximately 8 km-long stretch. However, this time the U load increases to over 3 t/a (3 196 kg/a at C2H175 + 27 kg/a from Blyvooruitzicht GM  424 kg/a still passing C2H069) (Fig. 11). Since the WFS dries up a few kilometres below C2H069, after filling a couple of small farm dams (some of which in recent years fell dry for the first time in their decade-spanning existence), a total of close to 3.5 t of U per year are somehow 'lost'. Together with U inputs from sources not included in the monitoring programme, such as sporadic stormwater-related discharges via the so-called 'Greenbelt canal' and the Varkenslaagte, a non-perennial tributary of the WFS that drains tailings seepage from unlined slimes dams of the West Wits Operations of AngloGold Ashanti (Tautona and Savuka Mines) as well as of Harmony's Elandskraal Mine (consisting of Elandsrand GM and the now decommissioned Deelkraal Mine), the total load of dissolved U received by the lower WFS is likely to well exceed 4 t/a. This is in addition to the input of particle-bound U in the form of tailings spills into the WFS, as frequently reported for the upper catchment where a tailings pipeline crosses the stream from Cooke gold plant to the Cook slimes dam located on the opposite bank (AED, 2006). Winde (2006a) further points out that the flushing off of windblown tailings dusts settling on nearby urban areas by stormwater run off may constitute another, thus far neglected, source of water pollution. Since many sinkholes in the now dry bed of the WFS were subsequently filled with tailings material, flooding of this dry reach during wet spells (several non-perennial tributaries such as Middle Vlei and Rietspruit are still discharging into the original stream bed of the WFS) may facilitate the transport of tailings material downstream. Especially in the headwater region the situation is further aggravated by waterborne erosion washing slimes material from old tailings dams directly into the adjacent streambed and its associated floodplain areas. The extent to which particle-bound U pollution may affect the fluvial system is difficult to quantify. Several studies which recently focused on U levels in sediments could be used to determine the particle-borne U load of the system. Analysing the ratio between different radioactive isotopes (the largely immobile Ra226 (De Jesus et al., 1987) and the highly mobile U238) could be used to distinguish between eroded tailings (high Ra226) and fluvial sediments, in which waterborne U is secondarily enriched (no Ra226), as a possible way to quantify the contribution of eroded and spilled tailings material to the total U pollution of the WFS. Groundwater U loads: The highest (relative) increase of U loads does not occur in the WFS but in dolomitic spring water from the BTC, which, in 1997, was found to be largely unpolluted. U levels in the upper Turffontein Eye, for example, rose by more than an order of magnitude resulting in more than a 10-fold rise of the associated U load. While the absolute mass of U additionally injected into the fluvial system is comparably small (88 kg/a), it is the trend of a continuous and, recently, steepening increase of U levels that is of concern. At the GMB spring (Site No. 39/ C2H011) the U load increased from 9 kg/a to over 40 kg/a, constituting (a purely concentration-based) load increase of close to 500% (Fig. 11). After a slight rise between 1998 and 2003, the average U level for exfiltrating groundwater at the Muiskraal Bridge (Site No. 35/ C2H161) appears to have significantly decreased between 2003 and 2006, even though the observed maximum concentration rose to 172 µg/ℓ  a U level commonly found in undiluted mine discharge, for example (Table 1b). Since no reliable flow data are available for this reach of the stream, field flow measurements were taken during the dry season of 2007, suggesting a flow rate of approximately 40 Mℓ/d (Winde, 2007). (Gauging station C2H047 located approximately 1 km downstream of the sampling sites was only active for 2 years in the late 1950s, during DWAF investigations preceding the de-watering permit.) Based on the latest U concentration data this results in a load of some 190 kg/a of U discharged from the BTC via the WFS into the Mooi River (Fig. 11) representing a 40% reduction of the 1998 to 2003 load (319 kg/a). In both periods exfiltrating groundwater from the lower BTC appears to be the single largest source of U pollution of the Boskop Dam, the main water reservoir of the Potchefstroom municipality (Fig. 11). Adding the loads emanating from the lower WFS and the GMB Eye, a total of some 230 kg/a U results. This, however, is less than a third of the total U load found to be entering Boskop Dam during May 1998 and December 2003 (803 kg/a) (Fig. 11). Given that only a small portion (approx. 15 Mℓ/d) of the spring water from GMB Eye flows into Boskop Dam at the sampling site (Site 40/C2H162), while the majority is routed past this point via an irrigation canal, only a part of the GMB contribution can be added to the total load, leaving an even higher amount of U flowing into Boskop Dam that is not accounted for. Taking the relatively small contribution from natural sources in the upper Mooi River catchment into account (Bovenste Oog: 15 kg/a), more than 700 kg/a of U must enter Boskop Dam from a source thus far unknown. This shortfall in U load coincides with a shortfall in flow amounting to some 100 Mℓ/d. Winde et al. (2009) detected significant volumes of groundwater discharged into the GMB wetland via sub-aquatic springs as the most likely source for the additional flow and U load measured at the inflow of Boskop Dam. Potchefstroom sources most of its water from Boskop Dam, supplemented by water abstracted from the Potchefstroom Dam a few kilometres downstream (Fig. 1). With an abstraction rate of some 40 Mℓ/d (predicted by Swart (1999) for 2005) and average U concentrations in both water bodies of 14 µg/ℓ and 11 µg/ℓ, respectively (owing to the low number of samples taken at the outflow point of Boskop Dam - C2H173 this average U level is omitted), the raw water intake by the water works of the Potchefstroom municipality is associated with an average U load of some 172 kg/a. Do the encountered U levels pose a health risk? 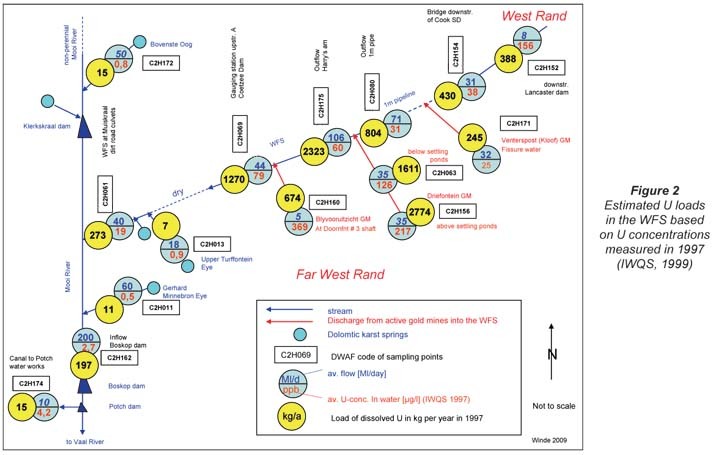 In total, close to 3 400 U analyses of water samples taken over a period of 13 years at 43 sampling points along the WFS and upper Mooi River have been analysed. 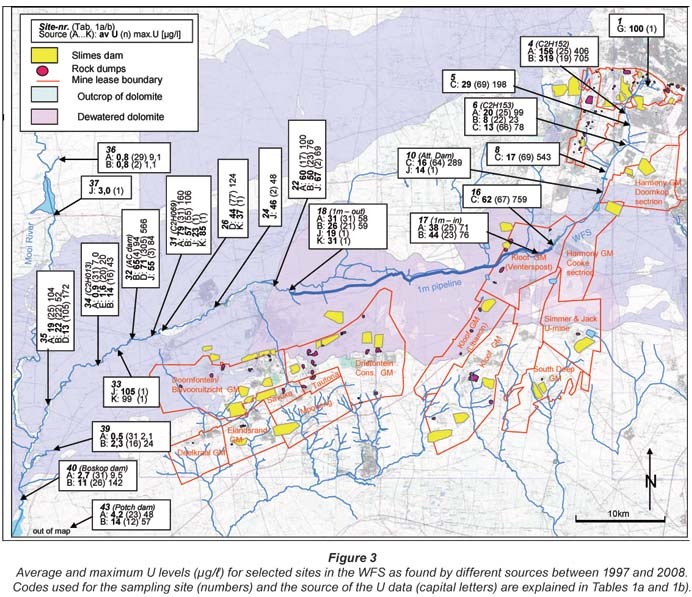 For the WFS as a whole this analysis suggests that, at least temporarily, unacceptable high levels of U are present over the entire stream length, stretching from its source area at an abandoned gold mine to the lower BTC where it disappears into the karst aquifer and re-appears before joining the Mooi River. 'Unacceptable' in this context refers to the fact that U levels exceed applicable legislative U limits in South Africa for irrigation and domestic water at several sites for most of the time. This includes not only sites in the highly-polluted headwater region with a comparably small throughflow (e.g. Site 4: C2H152), but also sites with significant discharge volumes such as Donaldson Dam, Harry's Dam and Padda Dam (average 40 Mℓ/d to 100 Mℓ/d), as well as gauging station C2H069 (Site No. 31, average 20 Mℓ/d to 40 Mℓ/d). In addition, it is of particular concern that U levels in the WFS are comparable to those found in the Pofadder area where they were statistically linked to the occurrence of abnormal haematological values related to leukaemia in people drinking this water (Toens et al., 1998, Table 3). Employing a GIS-based, spatial correlation technique, Toens et al. (1998) found a statistically verifiable correlation between U concentration in groundwater from 69 boreholes (used as a source of drinking water in this remote, arid farming area) and high counts of abnormal lymphocytes in peripheral blood from 418 people (16 years and older) sampled at 52 different locations in the Kenhard District west of the 20°E meridian. These abnormal haematological values have been linked to leukaemia, from which many residents of the area suffer and which was the very reason why the study was initiated (Toens et al., 1998). Uranium in this area mainly originates from uraniferous gneisses leading to concentrations in associated groundwater ranging from 10 µg/ℓ to a maximum of 478 µg/ℓ (Table 3). This range is comparable to that found in the WFS. Reported cases of leukaemia occurred at farms with U levels as low as 40 µg/ℓ to 70 µg/ℓ (Toens et al., 1998). (It must be noted that, according to Toens et al. (1998), despite a generally low residential mobility, migration across farm boundaries sporadically occurs. In a follow-up study for DWAF, Wullschleger et al. (1998) established that groundwater with elevated U levels was used for domestic purposes in many more settlements of the N-Cape. Triggered by these reports and a related article in the Cape Times (February, 1999), in April 1999 another DWAF study was conducted sampling 10 boreholes 5 times between April 1999 and August 2000 (Sekoko et al., 2005). Sekoko et al. (2005) confirmed elevated radioactivity levels in some boreholes of the N-Cape while finding little or none in others, remaining inconclusive regarding associated health risks.) These levels (40-70 µg/ℓ) are almost continuously exceeded in most reaches of the WFS, in some instances by up to an order of magnitude. With over 300 µg/ℓ, the average U concentration in the uppermost WFS is almost 3 times higher than the average U concentration in groundwater of the Pofadder area (Table 3). Furthermore, U peaks moving down the WFS are well above the maximum U level found in the Pofadder groundwater. Therefore, in cases where people in informal settlements may continuously use stream-water as main or even sole water source (even though this may be illegal), this could pose a significant health risk. An even greater risk exists for people using water directly from mining sources such as canals. This is especially true for inhabitants of informal settlements with no formal water supply, who were frequently observed to use untreated water (IWQS, 1999; Winde, 2006a; Barthel, 2007). In some cases such mine-water exceeds levels observed in the Pofadder area by an order of magnitude (Table 3). Possible interactions of U with As, which combined were found to correlate with abnormal lymphocyte counts even better than they did individually, can now be excluded, since the As-levels were later found to be wrongly determined owing to analytical errors made in the 1981 AEC dataset used by Toens et al. (1997) (Van Wyk and Coetzee, 2008). However, Van Wyk and Coetzee (2008) confirmed in 2 separate studies the correctness of the U values determined in 1981 (Table 3). This is in addition to the confirmation of elevated U levels in 10 additional boreholes north of the area covered by AEC data by Toens et al. (1997) themselves (Table 3). Any possible relationship between health effects and groundwater quality can in principle only be discovered if a statistically significant number of people use this water continuously as more or less the only source of drinking water over a sufficiently long period of time. While such conditions are difficult to find in more developed areas, such as the gold mining regions of South Africa, where a generally high residential mobility and better access to alternative water sources reduce the average exposure to polluted water, the remote arid farming area of the Northern Cape may be one of only a few in South Africa that meet these criteria. Coinciding with the presence of high U levels in borehole water this allowed that an epidemiological approach could be successfully employed, i.e. could detect a possible link between water quality (as common denominator linking all residents) and health effects at a reasonable degree of confidence, defying the masking effects of residential mobility and other factors. From a water user survey conducted along the entire course of the WFS as part of the IWQS study it can be established that a minimum of some 350 people, at the time, were likely to be using untreated water directly from the WFS or from adjacent mine canals for domestic purposes. For some of these people polluted stream-water or mine effluent was reported to be the only source of water. Some 150 people living next to the Driefontein canal were reported to use discharged water from the gold mine directly from the canal, and untreated, for domestic purposes (IWQS, 1999). Other exposure pathways discernable from the survey include the use of mine effluent and stream-water for irrigating garden vegetables (for own consumption) and commercial crops as well as for watering of livestock used for own consumption and commercial production. Another pathway along which U may enter the food chain is the frequently encountered consumption of fish caught not only in the stream and its dams but apparently also in mine-water canals. For this exposure pathway alone annual doses exceeding the 1 mSv/a limit by up to 180% were calculated for all age groups except the 1-2 year old (IWQS, 1999). In view of continued population growth in the area since 1997 the number of potentially affected people has most likely increased, especially in lower and lowest income groups, as most exposed and most vulnerable parts of the population. In order to compare measured U concentrations in the WFS to dose-based guidelines, the relationship established in IWQS (1999) is used to convert U concentrations into equivalent doses (hypothetically) assuming that the sampled water would be used as continuous source of drinking water (Table 4). In terms of the assumed use as drinking water not all water types in Table 4 are, of course, relevant. However, of those waters which could potentially be used as drinking water some exceed the applicable guidelines. This includes stream-water in the upper WFS (at station C2H152), where the average as well as the maximum U level would both exceed the WHO limit for drinking water as well as the single facility limit of the NNR. While the highest average U concentration measured in the lower WFS would not exceed the WHO limit and thus not be of radiological concern, the measured U maximum would. The same applies to groundwater from the BTC which on average poses no radiological risks but at maximum levels results in more than double the dose permitted by the WHO and falls just below the single facility limit of the NNR (Table 4). It should also be noted that all mine-water types listed well exceed the single facility dose stipulated by the NNR. This is of particular concern regarding the discharge of mine effluent where the drinking water pathway alone would exceed the NNR limit by 100% (Table 4). Despite significant decreases in U concentrations and U loads discharged by some mines in the FWR, the overall level of U pollution in the WFS remained more or less constant at an unacceptable high level. Especially in the upper WFS, average and peak concentrations of U increased significantly at some sites quadrupling the load of U exported downstream. This is largely, although not exclusively, caused by the discharge of large volumes of semi-treated, or possibly even completely untreated, decant water from the flooded mine void in the West Rand. Between 1998 and 2008, on average 1.6 t of dissolved U were discharged into the WFS from mining sources in the WR alone. Arriving via the 1 m pipeline in the lower part of the catchment, the WFS receives at least the same order of magnitude in U load from gold mines in the FWR, mainly via large volumes of contaminated water pumped from the mine void in de-watered dolomitic compartments. With more than 3.5 t/a U, a significant amount of the radioactive heavy metal is transported towards Potchefstroom. Fortunately (at least for the past couple of years), this fluvial load does not arrive at the Mooi River, since the WFS dries up several kilometres before reaching the confluence with the Mooi River. While the exact causes of the water loss still need to be determined, it is assumed that a significant proportion of the stream flow is lost to the underlying karst aquifer of the Boskop-Turffontein Compartment (Winde, 2008). Groundwater from this compartment sustains flow in the lowest stretch of the WFS and enters the streambed via 2 karst springs and diffuse baseflow a few kilometres upstream of the confluence with the Mooi River. While this groundwater in 1997 was found to be largely unpolluted with U, this changed significantly. Between 1998 and 2003, the total U load flowing into Boskop Dam as main water reservoir for Potchefstroom increased 4-fold. Re-occurring peaks of U concentrations accompanied by otherwise low U levels suggest that this increase is not caused by a pollution plume slowly moving through the BTC but rather triggered by distinct, short-term events such as rain storms which somehow mobilise U. Currently research is underway to determine the exact sources, mechanisms and pathways of this groundwater pollution (Winde et al., 2009). With more than 800 kg/a of U flowing from the BTC into Boskop Dam (of which, in turn, approximately 20% finds its way into the water supply system of Potchefstroom) indirect pollution via a large karst aquifer rather than direct stream pollution of the WFS, as previously believed, currently appears to be the main threat to Potchefstroom's water supply. However, compared to tap water and bottled mineral water from areas with U-rich geology (such as Scandinavia), U levels detected in tap water of Potchefstroom (max. 4.4 µg/ℓ) are comparably low. The detected levels fall, however, within the category of 150 out of 8 200 tap water samples taken in Germany which exceed the German 2 µg/ℓ-guideline for 'baby-safe' mineral water used to flag potential problems (Table 3). In view of the highly dynamic behaviour of U in fluvial systems and the associated large amplitude of fluctuations, it is, however, likely that U levels higher than those found in the 3 grab samples quoted in Table 3 occur. In order to estimate how much higher such U maximum could be, the ratio between average values and maximum concentrations was calculated for all sampling sites representative of water flowing into Boskop Dam and the Potchefstroom water works. Based on a total of 449 samples from 20 sampling sites in the upper Mooi River and the lower WFS, a mean average-to-maximum ratio of 1:6 was found indicating that U peaks are on average 6 times higher than the U average value. Based on this U peaks of about 24 µg/ℓ were to be expected. Since the probability of hitting isolated (short-term) U peaks increases with the number of samples taken, sites with a high number of samples commonly also display higher maximum U values. This, in turn, increases the average-maximum ratio, which was found to weakly, but statistically significantly (at a 95% confidence level), correlate with the number of samples taken (Fig. 12). Assuming that the highly dynamic U levels in the raw water are reflected by associated fluctuations in the tap water (short-term), U maxima in Potchefstroom tap water of up to 55 µg/ℓ (based on an average to maximum ratio of 1:13 if more than 100 samples are available) are not to be excluded. Based on a large body of unpublished, secondary data generated between 1997 and 2008, this paper attempts to characterise the extent to which natural surface water and groundwater resources in the WFS catchment are polluted with mining-related U. This, in turn, was used to compare U levels in the WFS catchment to those found in other areas worldwide and adopted by international guidelines, allowing for a first-order approximation to assess to what extent U-polluted water may or may not pose a health risk to water users. While, for geological reasons, tap water in some areas of Canada and Scandinavia displayed higher U maxima than found in the WFS (Table 3), the average level of pollution present over the entire length of the WFS is well above most international guidelines and comparable to those found in groundwater of the Northern Cape (South Africa), which has been linked geostatistically to abnormal haematological values related to leukaemia. This is assumed to be related to the fact that polluted groundwater in the area has been consumed over long periods of time as the only source of drinking water. For a limited number of people, especially those living in informal settings along the WFS, such long-term exposure resulting from the continuous use of untreated stream-water or mine-water (even though it may be illegal) cannot be excluded. However, owing to a generally higher residential mobility for many of the migrant workers and job seekers, duration of exposure may, on average, be less. It also needs to be stressed that the overwhelming majority of residents in the WFS catchment have access to good quality tap water provided by Rand Water and are thus exposed much less, if at all, to polluted drinking water. Considering all possible exposure pathways it is estimated that currently several hundreds, if not thousands, of mainly poor people may be directly affected by water pollution at varying degrees of intensity. Immediate intervention should be considered for situations where polluted water is the only source of drinking water and where such water finds its way into the food chain of subsistence farmers either via irrigation of gardens or livestock watering or both. Such intervention is particularly urgent since most of the exposed population is commonly the most vulnerable, owing to a range of poverty-related stress factors including malnutrition, prevalence of infectious diseases related to sub-standard sanitation, lack of medical health care and high HIV infection rates, to name but a few. In view of the fact that U pollution of stream-water is still ongoing and likely to continue for some time into the future, intervention should preferably target the habits, economic and living conditions of the most vulnerable groups. This should be based on an updated, sufficiently detailed and comprehensive survey of people currently using polluted water in the catchment. It is believed that this would be more effective in terms of health protection than currently suggested attempts of isolated clean-up operations involving removal of polluted sediments from a few selected sites along the WFS (Ilisio Consulting Ltd., 2008). Apart from the danger of remobilising U and other heavy metals in the process, and destroying environments such as wetlands and dams, which currently act as sinks for fluvial contaminants, such intervention could only be of short-term success given that water pollution, as root cause of the sediment contamination, continues. U concentrations and loads in dolomitic spring water, which in 1997 were largely around background values, have increased markedly since then. Constituting a major source of water for the downstream municipality of Potchefstroom this trend is reason for concern. Pollution of the spring-water is generally of intermittent nature suggesting short-term inputs of U rather than continuous pollution as cause of the problem. However, lower-lying groundwater in the same dolomitic compartment did not deteriorate but appears to even have improved over the same period of time. The reason behind such distinctly different behaviour of U levels in a single compartment is unclear and should be investigated. The average concentration of U in the tap water of Potchefstroom falls well below the current WHO guideline of 15 µg/ℓ but exceeds the 2 µg/ℓ limits used in Germany to flag possible problem areas. However, with only 3 samples available the average used is of very low temporal representivity. Based on an established correlation between the number of samples and the level of detected maximum concentrations of U in raw water used by the Potchefstroom water works, it is estimated that peak U concentrations in tap water (i.e. in water that passed through the purification process) of up to 55 µg/ℓ may occur. While this would still be below the South African drinking water limit for U it well exceeds those of other countries (including the WHO), all of which may need to be lowered following recent findings on U toxicity. While the actual level of U in water resources of Potchefstroom may not yet pose a serious threat (even though the high peak concentrations at Boskop and Potchefstroom Dams appear to be problematic), the trend of increasing U levels since 1997 in spring water, which accounts for a large percentage of the inflow into Boskop Dam, is reason for concern. In this context an in-depth investigation into sources, pathways and mechanisms associated with U pollution of the Boskop Turffontein Compartment is urgently recommended. Cognisance also needs to be taken of the fact that the efficiency of removing dissolved U from raw water through the standard potabilisation processes employed at the Potchefstroom water works is most probably relatively low, due to the chemical composition of typical dolomitic water (high concentrations of hydrogencarbonate, calcium and magnesium ions), of which nearly all of the treated raw water consists. Elevated levels of U detected in calcite scales of water kettles sampled in Potchefstroom support this assumption. Although direct impacts of U pollution in the WFS on the Mooi River could not be established since the stream dries up well before its confluence, it is likely that U-polluted stream-water from the upper BTC finds its way into the underlying karst aquifer eventually affecting the Mooi River system indirectly. In view of the importance of the BTC as the single largest water resource in the area, it is recommended to investigate how exactly mining-borne U arrives in the aquifer as well as the rate at which it is transported, and which pathways within the karst aquifer are used. This is aimed at improving the capacity to predict future pollution loads affecting the water supply system of Potchefstroom and at designing suitable means for long-term control of pollution sources and pathway-related mitigation during and after active gold mining. This, however, requires at least the continuation of existing monitoring programmes on U levels and other water quality parameters, preferably in a more coordinated manner including the standardisation of sampling schedules and protocols, analytical procedures and data reporting. This should include the relevant monitoring data gathered by all mines which affect the WFS, as well as data from municipal and government monitoring programmes, preferably pooled in a single, easily accessible database which could, for example, be linked to a website. In addition to water quality, water flow also needs to be monitored. Despite recent upgrades of gauging weirs and flow-measuring devices in the area by the DWAF Hydrometry section at Boskop Dam, many more reliable flow-gauging points are needed in the catchment in order to quantify the complex flow system in this karst area. Reliable water quality and flow are required as a basis for regulatory authorities to introduce load-based limits for U and others substances. It is recommended that load based limits be introduced as soon as possible, complementing existing concentration limits. WULLSCHLEGER NJ, VISSER D and STADLER W (1998) Groundwater health hazards of selected settlements in the province of the Northern Cape. Report to the Department of Water Affairs and Forestry (unpublished. [ Links ]). Received 20 March 2009; accepted in revised form 23 February 2010.